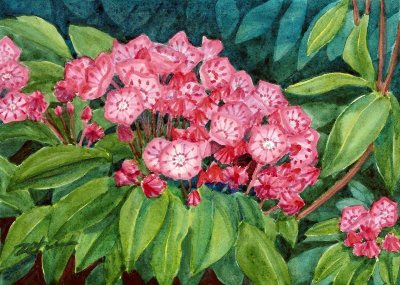 Mountain Laurel is a native evergreen shrub in this part of the US. and can be found growing throughout the woodlands. When in deep shade, it doesn't bloom much, but those growing in clearings can be magnificent. The woods around my house are full of laurel. They unfortunately get trimmed of all foliage below five feet during winter. That's how high a hungry deer can reach. But luckily, the laurel grows much taller than five feet! This painting was both fun and a challenge. I think you'll appreciate the detail in the flowers, leaves and background.